Kenisha McIntosh is a life coach who is known for the consistency of her results and the deep bonds of trust and respect that she builds with her clients. She is a certified life and business coach, who views communication as the most integral component to healthy personal and professional relationships. Guiding her clients to reach their career, relationship, health, and educational goals, she operates on a level that is universally applicable, getting to the heart of any issue and finding out what is stopping her clients from getting to where they want to go. Life Coach Kenisha’s strategy is all about connecting people with their natural passion and purpose. By teaching people how communication impacts their lives, she helps to create lives that are empowering, intentional, and fulfilling. After earning her Bachelor’s Degree at Howard University, Life Coach Kenisha went on to work first in public relations and then in event planning. She has accrued a broad set of skills, helping her to understand that significant growth is always found within and that each one of us can be either our own worst enemy or our own greatest ally. 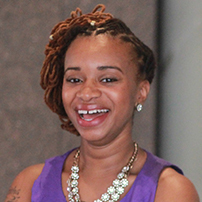 Kenisha is a life coach who cares and who puts in the effort that it takes to get the job done. If you are ready for a change, a big change, a real change, Life Coach Kenisha is the coach for you.